Martin L. Hopp, MD, PhD is medical director of the Cedars-Sinai Sinus Center and an otolaryngologist at the Head and Neck Cancer Center and the Division of Otolaryngology at Cedars-Sinai Medical Center. In 2006, Dr. Hopp received the prestigious Honor Award from the American Academy of Otolaryngology/Head and Neck Surgery for distinguished service. Your turbinates are responsible for cleaning and humidifying the air as it moves through your nose and into your lungs. Some people’s turbinates become inflamed when they encounter an allergen, triggering an inflammatory reaction. Relax: Having inflamed turbinates is not quite as scary as it sounds. There are a few things you can do that can help you feel better, instantly. Turbinates are bony projections located on both sides of your nasal cavity. There are typically three sets of them: the inferior turbinate (which is the largest and is located closest to your nostril), the middle turbinate (the second largest) and the superior turbinate (the smallest). The turbinates filter out the dust and particles by expanding and contracting regularly, usually about twice a day: once on the left side and once on the right. This process is completely normal, and goes unnoticed by the majority of people. When a person comes into contact with something he is allergic to, such as tree pollen, the body treats that substance like a foreign invader. This can prompt reaction that causes inflamed turbinates. However, allergens are not the only things responsible for these nasal problems. People who are sensitive -- but not allergic -- to pollution or dust in the air also can experience inflamed turbinates. When your turbinates become inflamed, it could result in a blocked nasal passage, usually referred to as a stuffy nose, which is a common allergy symptom. 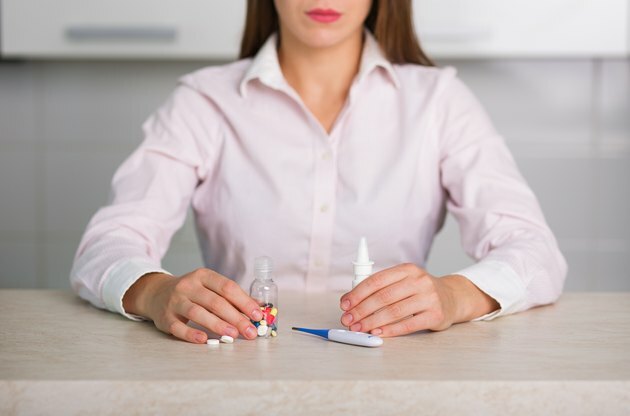 One common treatment for inflamed turbinates is Nasonex, a prescription medication used to treat nasal allergy symptoms. Other nasal saline drops and nasal steroids can work as well. Perhaps one of the simplest ways to fix the problem is simply to take a hot shower; the steam may help soothe the inflamed turbinates. Skip the sauna, however: Dry air exacerbates the problem.